Home » Linen, Facilities, and Uniform Services Blog » Laundry Services » Is On-Site Laundry Right for Your Business? In the business world, first impressions are everything. When you walk into a hotel room, the presentation and overall cleanliness of the room are some of the first things you notice. The same is true for restaurants—the look and feel of the dining room are telling characteristics of the quality of your business. In order to maintain a professional appearance, these and other industries are constantly having to wash towels, bedsheets, aprons, uniforms, linen napkins, and so on. Therefore, a decision needs to be made regarding whether or not these services will be performed in-house, or by outsourcing to a specialized company. Implementing an on-site laundry facility has its benefits and drawbacks depending on the size and type of business you are running. The purchase of an industrial washing machine, along with your uniforms, towels, napkins, etc., can translate to a hefty initial cost. However, many long-term costs that would be associated otherwise—such as rental and laundering expenses—are eliminated. What are the Benefits of an In-House Facility? Professional Image – When you make the decision to purchase or lease your company linens, you are able to choose their quality and appearance. For example, restaurant owners purchasing linen napkins can choose the durability and color, and can even add a company logo to really set themselves apart. Another advantage of purchasing or leasing is that a professional business image will remain consistent throughout the entire company. You will not have to rely on your employees to purchase the appropriate work attire, and they will be more likely to take better care of their own garments. Long-Term Cost Savings – Having an in-house laundry facility will cut out many of the long-term costs that you would be paying otherwise. For instance, rather than having to pay to rent your company linens each month, you will be paying a one-time cost to purchase or lease. On-site laundry services will also prevent you from having to pay to outsource those services to another company. However, keep in mind that you will have to pay an employee, or use your own time, in order to get the job done. Isolated Contaminants – One of the most important advantages, especially for the healthcare industry, is that you and your employees will not track any workplace contaminants home with you at the end of a shift. Restaurant workers often come home with food and drink spills, industrial workers come home covered in dirt and grease, and healthcare workers can carry germs and infectious diseases. Getting rid of these types of contaminants requires a specific laundering process, eliminating the option of washing these garments along with the rest of your wardrobe. Although there are a number of ways your business can benefit from in-house laundry services, there are a number of disadvantages as well. 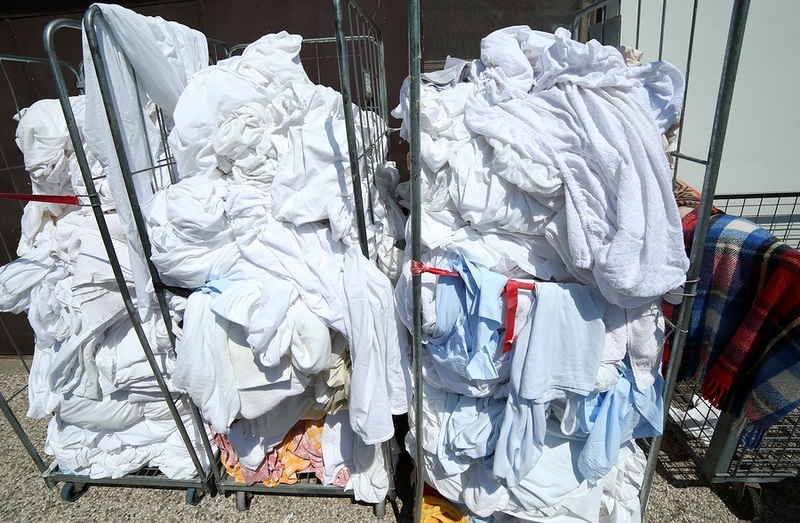 What Are the Drawbacks of On-Site Laundry Services? Time Invested – Outsourcing allows you to completely hand over the responsibility of cleaning your linens to another company, allowing you to remain focused on other important aspects of the business. In choosing to implement your own laundry facility, you are also making the decision to either take time out of your own already busy day to complete this important task, or to pay one of your employees to do so. Damage/Replacement Charges – When renting your linens from an outsourced company, many providers include a certain number of damage repairs and replacements as an added service with no extra cost. With purchased or leased company linens, you are responsible for the repair or replacement of damaged or lost linens. Depending on the longevity of the material and how your employees are handling the linens, this may rack up your bill over time. OSHA Regulations – The Occupational Safety and Health Administration (OSHA) has set guidelines for the proper cleaning and laundering of company linens. This is necessary to ensure the extraction of any harmful contaminants. An on-site laundry facility requires you to continuously provide the necessary information, resources, and training to your employees in order to remain compliant with OSHA regulations. As you can see, the disadvantages of an in-house facility are based upon your company’s time, as well as any incurred charges. Get Free Estimates on the Purchase of Your Company Linens Today! Are you ready to start utilizing the advantages of in-house laundering services? Uniform Nations partners with a network of contractors that can help you with finding the right company linens for your business. For free estimates, simply give us a call at (866) 467-4178 or fill out the form to the right. You will be connected with one of our experts that can answer any further questions and will help to set you up with the right contractor for your needs. Within minutes, you will receive multiple estimates for the purchase or lease of your linens from businesses in your area. This ensures that you are receiving the most affordable option available. Should I Be Renting, Leasing, or Buying Uniforms? Is the purchase of your company linens the right decision for your needs? This in-depth white paper provides you with the resources that you need to make an informed decision. If you are still not sure about whether or not an in-house facility is the right option for your business, this article goes into further detail about the pros and cons of outsourcing versus an on-site facility.